This issue needs no introduction. 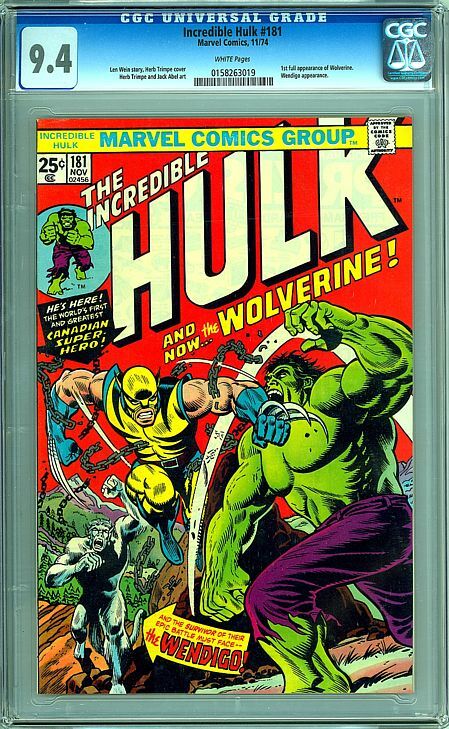 This colossal Bronze-Age monster key ushered in one of the true legends of superhero fiction - a fierce, all-Canadian, no-nonsense warrior. If there were a superhero hall of fame, Wolverine would undoubtedly be its first inductee. I'm offering a stunner of a copy which is every bit as nice in terms of the way it presents, centering, page and production quality. This copy has bright, reflective cover inks and carries the highest page quality designation a comic can receive (White Pages). Please click the image below to see high-res scans of the comic. Shipping: On an item of this value, and with PayPal being used as the method of payment, the book can only be sent using FedEx. Insurance will be extra. Buyer will pay exact shipping costs. If you have any questions, please feel free to contact us.